Some good bait fishing and trolling has been had in the area with some nice rainbows being caught in Eucumbene. You may recall in the report a couple of weeks back, that a huge brown of seven plus kilos had been caught spinning in lake Eucumbene. 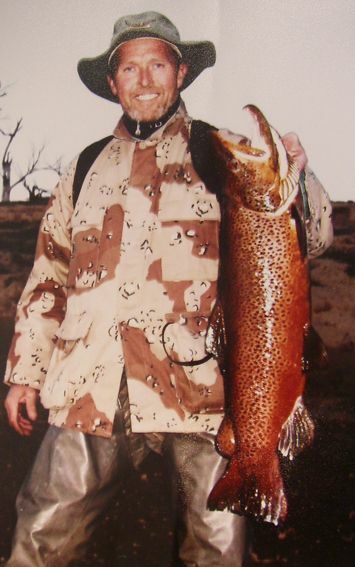 We have managed to get a photo of Gino Meznarsic and his cracker of a brown taken on the ever successful Snowy Minnow. The fish was caught off the bank and later released after Gino and his father Mario spent some time reviving the fish. Eucumbene:- Eucumbene trolling reports have been great with some really well conditioned rainbows being taken from around daphnea blooms. * Chris Mould and his wife Deane had a great two hour session catching seven kilo-ish rainbows on the downrigger. Fishing out of Old Adaminaby, Chris found some daphnea on the sounder and dropped lures down to 30ft on the downrigger. He said you could see an arch on the sounder and adjust the bomb to the same height and get a hit virtually straight away. Y82 Tassies was the lure that did the damage though it was the only colour tried on the rigger. Any yellow winged lure would do the job. Look for dark patches showing up midwater on the sounder. Trolling the edges early in the morning is worth a try too but the deeper water does seem to be holding more rainbows at present. Old Adaminaby, Angler's Reach and Cobrabald Bay are the best areas at present.